All skill levels welcome! We have one-day classes and ongoing classes for those who want to perfect the craft. Learn hand-building, the wheel, special techniques, and specific projects. Bring a friend—you’ll have great fun! All classes require a $25 non-refundable deposit upon registration. The balance can be paid over three payments. Just wanted to tell you and JJ how much I enjoyed the owl class last night. Super fun and relaxing. JJ does an awesome job of teaching the class – good clear instructions, very helpful and supportive. I also enjoyed the soft music and general atmosphere of the studio. Everyone seemed to be having a good time. What a lovely space to relax, have fun and be creative. 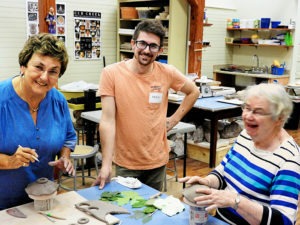 Whether you’re a brand new beginner or a seasoned artist, you can join us for an eight-week class to create unique work out of clay. This is a flexible, introductory-level course focusing on hand-building techniques, which includes the basics: pinching, coiling, paddling and rolling slabs. 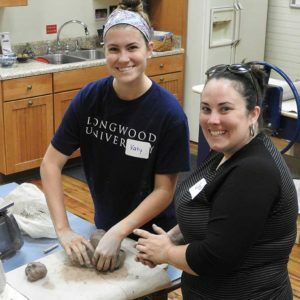 Participants will take home a variety of functional projects, including bowls, vases, trays and mugs. Students with previous experience can design their own creative plans. 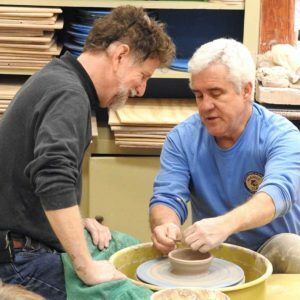 We will focus on the basics of wheel-throwing, centering, trimming and glazing techniques. Discussion covers clay fundamentals and design. 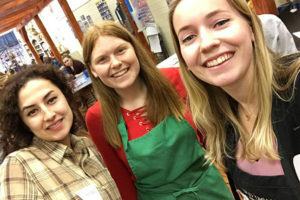 Students with previous experience will focus on personal projects as well as trying new techniques. Instruction will build on present abilities. The student brings their own supplies and works independently on the wheel or hand-building in the studio. 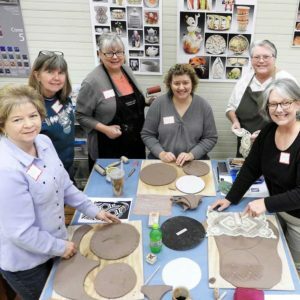 No open studio during classes or workshops.